Cutting: An excellent wine featuring cherry, black cherry, raspberry, vanilla, clove, black pepper and leather characteristics. 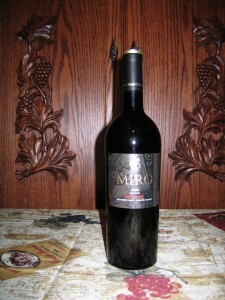 Cherry, raspberry, vanilla and clove aromas highlight the Miro Zinfandel Old Vine from Alexander Valley. On the palate, cherry and black cherry, black pepper and leather flavors come through. Some tasters noted a variety of other berry and exotic spice characteristics. It is a shame that a wine this good should finish last in any competition, but it is a testament to the overall quality of wines in our Alexander Valley tasting. This wine has a nice long finish and should appeal to most Zinfanatics.